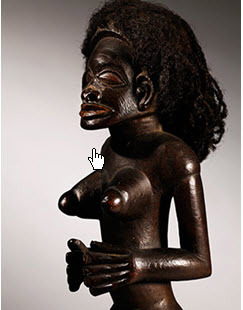 NEW YORK, NY.- Sotheby’s announced that selected works from the famed African Art Collection of Drs. Daniel and Marian Malcolm will be offered in an international two-part sale series in New York and Paris this spring. In almost 50 years of collecting together, the Malcolms carefully assembled a survey of best-of-type examples of the major sculptural styles of Sub-Saharan Africa, which is today known as one of the finest and most well-respected private collections in the field. As a tribute to the universal quality of this collection, Sotheby’s will present the selections in a unique two-part sale series, beginning with 12 lots to be offered on May 7 in New York and followed by another 12 lots of equal caliber to be offered on June 22 in Paris, with each respective selection representing a cross-section true to the exceptional quality and breadth of the whole collection. Overall, the series is expected to fetch in excess of $10 million. Dr. Marian Malcolm and her late husband Dr. Daniel Malcolm (1929-2015) acquired their first piece of African Art in 1966 and spent the following decades building a collection of outstanding breadth and quality, acquiring works in the American market and also during their travels in Europe. The couple brought a refined and scholarly approach to collecting, drawing on a deep, personal connection to the universal humanity of art as expressed by the sculptors of classical Africa. The Malcolms were extremely generous in their support of museums and academic institutions, frequently loaning works from their collection to many of the most prestigious museum exhibitions of the last several decades including those held at the Metropolitan Museum of Art, New York, the Museum for African Art (formerly the Center for African Art), New York, the National Museum for African Art, Smithsonian Institution, Washington, D.C., and contributing to institutional acquisition funds. Their willingness to share their enthusiasm for these artworks with the general public has contributed greatly to the wider public perception of African Art. 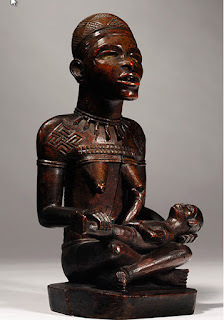 Most recently, several works from their collection were included in the critically-acclaimed exhibition Kongo: Power and Majesty, held at the Metropolitan Museum of Art in New York. Sotheby’s annual auction of African, Oceanic, and Pre-Columbian Art will be held on May 7 at the height of the auction season in New York. The sale will be led by a magnificent, monumental, and historic “Uli” statue from the island of New Ireland, which is the finest example of this iconic type in existence. Dating to the 18th century or earlier, the statue has been in the same private collection for over 35 years and was previously in the collections of Charles Ratton, Arthur Speyer, and the Museum für Völkerkunde, Berlin. Also on offer will be a carefully curated range of fine classical African Art, featuring selections from American and European private collections. On March 23rd of this year, the auction house Binoche and Giquello will scatter by auction the biggest collection of pre-Colombian Art, around Mexico and around Guatemala, never collected until now in Europe. This extraordinary set, constituted between the end of the 60s and the beginning of the 70s, is the testimony of the passion of a man who knew how to ally in its choices the rare and the beautiful. 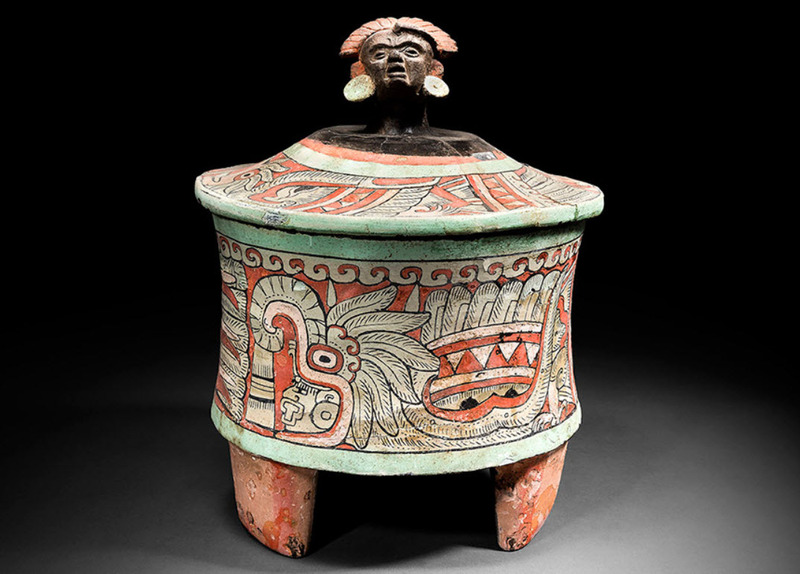 Covering the preclassic period until the periods Huastèques and Aztecs, these 70 funeral objects of a remarkable quality, reflect the incredible wealth of the Mesoamérican cultures. They offer a fascinating, sometimes intriguing esthetic view, where the world of the deaths is close to that of the alive and where the most modest objects are raised to the rank of masterpieces. Binoche and Giquello present here what is certainly one of the most important European collections of pre-Columbian, Mesoamerican art. A unique collection, that began to be assembled during the 1960s and early 1970s. From 1976 onwards most of the items in this fine collection were displayed in Brussels in the exhibition “Art de Mésoamérique”, accompanied by an important catalogue in which most of the items were reproduced. Sixteen years later, 1992, Belgium celebrated the 5th centenary of Columbus’ discovery of the Americas. The Musées Royaux d’Art et d’Histoire, Brussels commemorated this event with the finest exhibition ever mounted world-wide concerning America before the arrival of the Spanish. It displayed objects from different cultures and civilisations from Alaska in the North to southern Patagonia, so traversing the entire American continent. The selection of objects for the Meso-American section (Mexico-Guatemala) ran to one hundred and thirty items from leading museums throughout the world (Metropolitan Museum, New York, Kimbell Art Museum, Cleveland Museum, Museum of Fine Art, Boston, The British Museum and the future Musée du Quai Branly to name a few), and the most important private collections. Thirteen items from our group are reproduced in the magnificent catalogue, still a basic reference, produced on this occasion. What strikes us, considering this collection, is the vision of a man who knew how to combine the rare with the beautiful. It leads us on an aesthetic voyage where even the most modest objects are of the quality of master-pieces. “In the beginning was the Word, No ! In the beginning was emotion, the word was invented next to replace the emotion” said Céline. It is the case for this magnificent collection. The sale begins with Pre-classic statues (1200-600 before Christian Era), that is the most ancient known, derived from the sites of Tlatilco, Las Bocas and Xochipala in Mexico, with some magnificent Venus estimated from 8 000 to 25 000€. The village cultures of West Mexico (Proto-classic, 100 BCE – 250 CE) are represented by an imposing couple, Nayarit culture (estimated 40 000/60 000€), and by a very lovely, red, Colima earthenware mask (estimated 18 000/20 000€). Some rare Teotihuacan culture objects will be presented, among them a funerary mask in green hard-stone from the Classical period (450-650), estimated from 300 000 to 400 000€. This is followed by two Monte Alban urns, exceptional for their beauty and fine state of preservation (450-650), the larger one estimated between 250 000 and 300 000€, the smaller one, 80 000 to 100 000€. The sale continues with ceramic figures representing priests or dignitaries from the Veracruz culture that extended from the Gulf to Mexico in the classical period (450-650). Also noteworthy is a series of ceramic dancers fitted with adjustable masks, tiny, but celebrated sculptures often published in reference works (estimated 20 000/25 000€). The Veracruz civilization is also marvellously represented by a circular mirror-back in schist showing a standing priest holding an obsidian knife. The mirror is complete (estimated 120 000/150 000€). This section of the sale is concluded by a curious earthenware turkey, certainly the top of a large anthropomorphic statue: the animal symbolises the great civilisations of Mexico (estimated 80 000/100 000€). It comes from the Merrin Gallery, New York where it was acquired in the early 1970s. The collection also houses an exceptional group of inscribed Maya vases dating from the Ancient Classic and Recent Classic periods. Jean-Michel Hoppan, a CNRS researcher, specialised in Maya script, has deciphered them and revealed their true significance (estimated from 20 000 to 150 000€). A tripod vase with a stucco decorated cover surmounted by a male head in an exceptional state of conservation should be noted (estimated 120 000 to 150 000 €). The sale ends with several fine stone sculptures from the Huastec and Aztec periods (1400-1500), estimated between 30 000 and 70 000€.